As I was untangling organizing my scrap yarn, I was pondering mt next project. I didn't have enough yarn to make something big. Just little bits here and there. I thought about a hat, but I just made some about a month ago. I finally decided I would make a quick headband. I remembered pinning a headband pattern, or two on pinterest. I wanted to add a flower, too. I pinned some of those as well. I don't know if you all do this, but I frequently pin things, then go back and look at the actual post later. Well, this was one of those times. I was really wishing that I had at least peeked at some of them before attempting to make something on my own, as I draw inspiration from other works. BUT, with one of the computers on the fritz and the other being used, I couldn't even peek at them, let alone the pictures I repinned. I had to go this one alone. I tried a few different things for the headband. 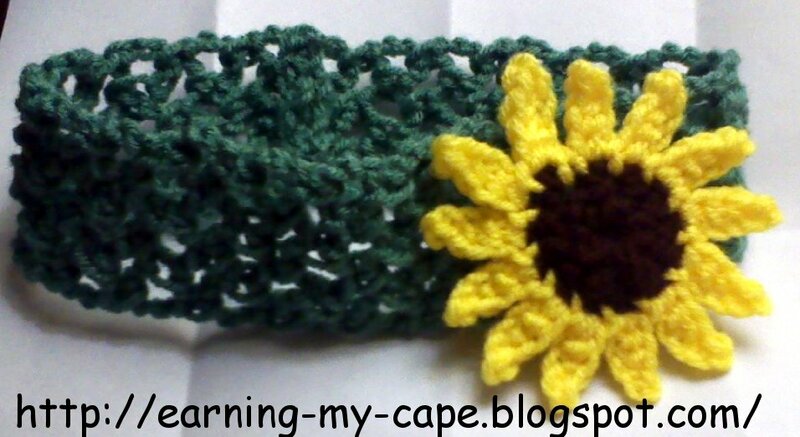 Having just worked with a net stitch on a blanket I made, I wanted to try one with the headband. I wasn't liking it much, so I altered it. The result was much better. When it came to the flower, I had originally intended to do a simple little flower like the one on the poncho that I made or one like I used in the tic-tac-toe game I made. 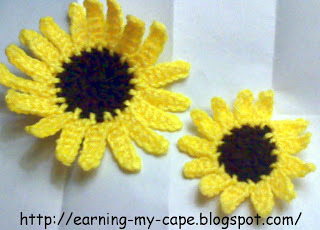 When I was deciding on the color, I saw the little bit of brown yarn and the bright yellow yarn that I had. It screamed Sunflower. I love sunflowers. They are so pretty! So, I decided to try to make one. My first attempt was actually pretty good. I had to mess with the petals a couple of times to get them the way I wanted, but after that little hurdle, it was much easier. Once it was finished, though, I thought it was way too big. I changed the stitches and altered the pattern and made a smaller one... it was the perfect size for the headband! So cute!! Thank you for linking this up to Fantabulous Friday @ Little Becky Homecky!! This is super cute! I'm just starting to crochet, and I'm definitely going to tackle this project next! I'm a new follower too! Thank you for the lovely (and free!) patterns. Thanks for linking up at Hookin on Hump Day, Susie! This is super cute!